Active since the early 90’s, Muniz uses unconventional materials, including wire, sugar, diamond, chocolate syrup, and colored paper to recreate well-known works of art or historical/news photographs images, and present them as photographs. Through the reconstruction of these images, viewers are provided with the opportunity to discover different layers in the visual image’s background which we are usually and casually exposed to whether by the Internet or magazines. On view a selection of works never shown in Japan before from his series “Postcards from Nowhere”, where postcard-like sceneries are recreated through the use of actual postcards, an object whose importance and material value has deeply changed, and “Album”, where actual family shots, photographs taken to commemorate special times, and intimate moments are recreated through commemorative personal images obtained from SNS. 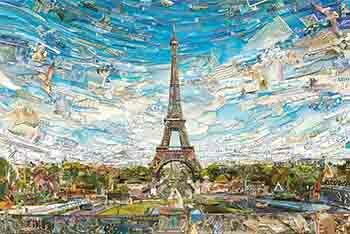 Moreover, Vik Muniz will present a new work in occasion of KYOTOGRAPHIE International Photography Festival (Kyoto) which will start from April 13th.Commissioned by Champagne house Ruinart, the new work will be presented through a series of events worldwide starting from Hong Kong Basel.